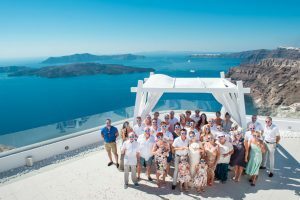 Santorini celebrant cooperates with all of the wedding planners in Santorini. 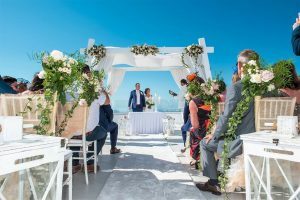 If you book officially your wedding ceremony through our web site is a guaranty that Santorini celebrant will be available for your wedding day and time in Santorini and the cost for the ceremony only is 300 euros! Your wedding in Santorini is about to start and you are very excited about it! Your guests are so looking forward for this Special Day and you just miss a small but really important element… Your Wedding Celebrant! 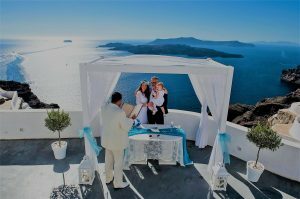 So, if you are having a Symbolic Wedding in a beautiful location around Santorini, then we can help you with your Ceremony! By providing assistance on your vows and important guidance on how to plan the ceremony, your wedding will be an absolute fairy tale. Contact us today to learn more about booking a wedding celebrant by using the title “Wedding Celebrant” and all important details of your wedding day. An important note: a Wedding Celebrant is not a Registrar. For Civil Weddings in Greece, there are various legal papers you should collect in forehand. Please take a note that civil weddings paper collection and translation could take up to 6 weeks to be collected. FOR CIVIL WEDDINGS TO ORGANIZED YOUR WEDDING DOCUMENTS, YOU CAN CONTACT THE WEDDING PLANNERS BELOW.